There is always something poignant about a play that deals with true events and particularly so when the main characters have struggled to achieve something against the odds. ‘That Golden Age’ puts an interesting slant on this concept by showing how crime on the high seas in the eighteenth century gave birth to a peculiar form of feminism. Mary Read and Anne Bonny are documented as having been two of the most notorious pirates operating in Caribbean during the so-called ‘golden age’ of piracy. Literally commanding hundreds of men and hijacking dozens of merchant ships, it took a Royal Navy captain Jonathan Barnet, sent out at the request of the Governor of Jamaica, to put an end to their high-seas adventures. The women were certainly not a pair of nautical Robin Hoods but neither were they just feminized-Blackbeards, with piracy not having been the first choice of either of them. This is essentially the story of two women’s attempts at survival in a man’s world, after differing circumstances forced abrupt ends to otherwise more stable and comfortable lifestyles. The story is imaginatively told through the eyes of Anne Bonny in old age, as she looks back on her times with Mary Read and their comrade in arms, ‘Calico Jack’ Rackham. There follows a sequence of flashbacks, as we learn how the women became pirates, how they were perceived both by the Jamaican society and the representatives of the British government and finally, their very different ends. The cast play the four main characters, doubling up as respectable townspeople with able versatility. Rebecca Fenwick convincingly portrays the older Anne Bonny, showing a very human side to the former-adventurer as she wiltingly sets out the tale in a rustic Irish accent. Mary Hooton as Mary Read bring dynamism to the stage as she takes on all comers with a sword, easily getting the better of the swaggering ‘Calico Jack’, nicely played with a light touch of comedy by Adam Urey, which contrasts well with the feistiness of the women pirates. The various exchanges amongst the trio start playfully enough but become progressively darker as their buccaneering fortunes decline. The dramatic intensity of Joel Parry as the determined Captain Jonathan Barnet reminds that us the fight against piracy was a serious business. Barnet takes an almost sadistic delight in hanging pirates, which is shown very effectively in a dramatic interrogation scene. After so much glamorization of piracy, particularly in recent years by Hollywood, ‘This Golden Age’ aims to take a serious look at what it actually meant to be a pirate at that time. 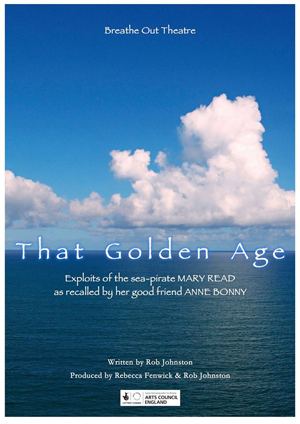 ‘That Golden Age’ is set very simply but this play works through the drama created by the narrative, together with some well-choreographed action, and we are very much told a story which leaves room for contemplation as to what extent Mary Read and Anne Bonny were either amoral opportunists or victims of a harsher time, in which the opportunities women had to make their own way in the world were limited. Overall, a very entertaining show with strong performances and a compelling plot.